Why America needs the STATES Act. 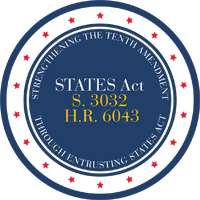 The Strengthening the Tenth Amendment Through Entrusting States (STATES) Act is a bill in the United States Congress that would recognize legalization of cannabis and the U.S. state laws that have legalized it through their legislatures or citizen initiative. It was introduced on June 7, 2018 by Senators Cory Gardner (Republican from Colorado) and Elizabeth Warren (Democrat from Massachusetts) as S. 3032. A companion bill was introduced the same day in the House of Representatives, sponsored by Earl Blumenauer (Democrat from Oregon) and David Joyce (Republican from Ohio) as H.R. 6043. The act would amend the Controlled Substances Act of 1970 to make it impossible to prosecute individuals or corporations who are in compliance with U.S. state, U.S. territory and the District of Columbia, or tribal law on cannabis, with certain additional provisions such as minimum ages. The Strengthening the Tenth Amendment Through Entrusting States (STATES) Act ensures that each State has the right to determine for itself the best approach to marijuana within its borders. The bill also extends these protections to Washington D.C, U.S. territories, and federally recognized tribes, and contains common-sense guardrails to ensure that states, territories, and tribes regulating marijuana do so in a manner that is safe and respectful of the impacts on their neighbors. What does the STATES Act do? Amends the Controlled Substances Act (21 U.S.C. § 801 et seq .) (CSA) so that as long as states and tribes comply with a few basic protections, its provisions no longer apply to any person acting in compliance with State or tribal laws relating to the manufacture, production, possession, distribution, dispensation, administration, or delivery of marijuana. Amends the definition of “marihuana” under the CSA (21 U.S.C. § 802(16)) to exclude industrial hemp, as defined in section 7606(b) of the Agricultural Act of 2014 (7 U.S.C. § 5940(b)). The bill does not alter CSA Section 417 (prohibition on endangering human life while manufacturing a controlled substance) and maintains the prohibition on employing persons under age 18 in marijuana operations, two federal requirements with which states , territories, and tribes must continue to comply. The bill prohibits the distribution of marijuana at transportation safety facilities such as rest areas and truck stops (Section 409). The bill does not allow for the distribution or sale of marijuana to persons under the age of 21 (Section 418) other than for medical purposes. To address financial issues caused by federal prohibition, the bill clearly states that compliant transactions are not trafficking and do not result in proceeds of an unlawful transaction.